Description: The heavy, thickly-carved golden mask depicts a face surrounded by a fringe of feathers. Effects: Grants its bearer the ability to see and interact with items and beings in the spirit world from this side of the Gauntlet, as though she were under the effects of the Spirit 3 “Reaching” and the Spirit 2 “Peer Across the Gauntlet” spells, both of which are Persistent. 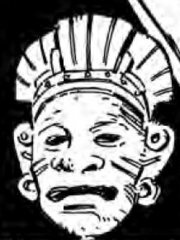 Info: In the early 1930s, a Mysterium archaeomancer discovered the first example of this Mask in one of the pyramids of Chichén Itzá. She named it for the legendary ancestral homeland of the Aztecs that some Awakened believe is a memory of Atlantis.